Protesting for more affordable housing, some UC San Diego graduate students in association with the UC Student-Workers Union (UAW) rallied in front of Jacobs Hall and marched through campus. On Tuesday, Feb. 19, grad students protested the Housing Dining Hospitality Office for planning to close two affordable housing complexes — the Single Graduate Apartments and the Rita Atkinson Residences — and inefficiently increasing housing costs. The protestors made their way to Revelle College for a closed-door meeting, where the UAW representatives presented their case to the Associated Residential Community Housing Advisory Committee. In addition to the aforementioned demands, they would like annual teaching assistant and graduate student research salaries to increase with rent increases and subsidized rents for students who work part-time in the year (25-50 percent of the time). “This protest is about having more affordable housing for graduate students,” Head Steward of UAW Ahmed Aktar said to the UCSD Guardian. “One of the things we’re protesting is the transfer of Rita and other traditional graduate school housing complexes to undergraduates. There is a limited number of graduate housing available and the price has gone up in the last few years. Starting in 2020, over 650 graduate students will no longer have the option of affordable housing at either SGA or Rita. The problem is further exacerbated by the fact that the price per bed will increase by 49 percent from 2016 to 2020. According to the US Department of Housing and Urban Development, people should be spending no more than 30 percent of their monthly gross income on housing. However, this is not considered as part of UCSD’s algorithm for charging rent on graduate housing; rather, they reduce the market values of housing by 20 percent. 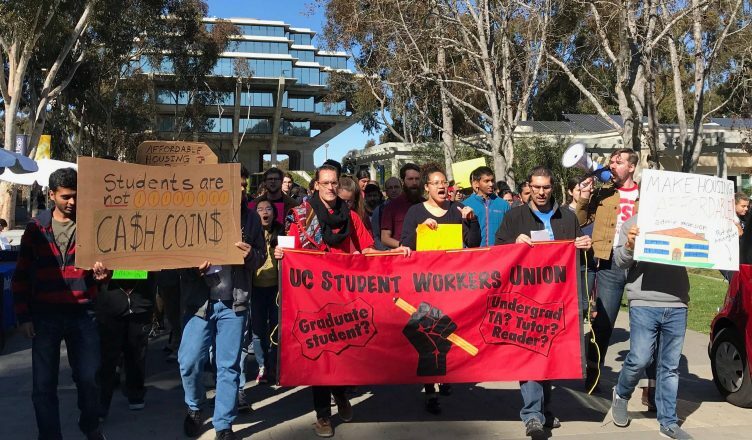 The algorithm does not consider the fact that graduate students earn less than half the average salary in San Diego County. The AHC attempted to email Chancellor Pradeep Khosla with supporting data on the housing problem, yet they did not receive a reply. Moreover, Steeve and Sven Burgerman, the leader of the movement, deliberated with the director HDH on how to best address their grievances. However, their attempts were to no avail, since HDH stands firmly with the 20 percent below market value housing metric. AHC believes that rent differentials are merely a Ban-Aid to the larger problem, ignoring the issue that students will continue to spend 30 percent or more of their monthly income on housing. In their powerpoint to ARCH, AHC stated that housing insecurities will decrease job performance, mental health, the well-being of families, and recruitment. Although no tangible result has come from their closed-door meeting, an ARCH Advisory Committee member did relay to AHC that the housing concerns were a recurring feature mentioned after discussions on budget proposals and proposed rent increases. AHC hopes to use media as a platform to explain the housing problem to graduate students who may be recruited later in the month. Am I stupid? Graduate students sign leases. There are laws about when/how/why a landlord can increase rent and none of them say “feel free to increase rent in the middle of a lease.” Why is it ok for Housing to break state law?